It’s not that I’m a snob about music but any world traveler will tell you that one of the most essential items in your rucksack is your music. My choice of tunes has become the soundtrack for many of my journeys, often saving my sanity. I can attest that there is nothing better then listening to your iPhone on a transatlantic flight, it evokes a wonderful state of being that takes you away from the crying babies and exasperated mothers. Music has protected me from exasperation when Egyptian wedding parties have still been going strong at two o’clock in the morning, as well as helping me pass days (not hours) while once waiting for a flight out of Kabul. I see music as a synthetic acid that enhances flashbacks of our memories and reaffirming our journey in life. For me, Justin Bieber’s mindless pop just doesn’t lend itself to the experience of tearing across sun-bleached sands in the Sahara desert in a Toyota Land Cruiser. The Clash’s ‘Rock the Casbah’, however, does a terrific job and always sets the mood. I have collected CDs from souks, bazaars, back alley kiosks and hotel lobbies; I’d like to think that, as a result, my taste in music is eclectic. You’ll find the blues of BB King, Middle Eastern dance, Bollywood, Japanese pop, electronica, soul, rock, tango and Neapolitan ballads on my iPhone. 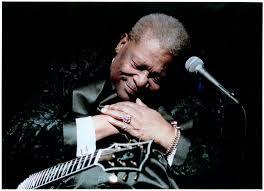 As Jimi Hendrix once said, “Music is a safe kind of high” and BB King’s music is a sanctuary for my restless and wondering mind. Thank you BB, you may have gone to meet your maker, but the thrill of your legacy will live forever.